Some of you may have seen this lot on Woodview next to Fonda San Miguels that is for sale and wondered if they are selling it as a farm. 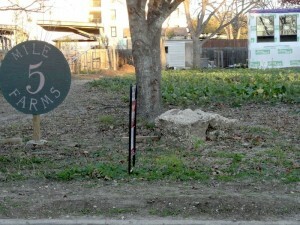 Turns out, it is one of the nine urban farm yards that 5-Mile Farms has around the city. 5-Mile Farms uses people’s backyards and vacant plots to grow vegetables. According to this article, the community supported agriculture (CSA) farm started wholesaling its produce to restaurants and grocery stores. Now it is selling the produce direct to the public. For $20 a week, members can choose their produce harvested from the various yard farms. They pick it up at the home of founder Randy Jewart on Jim Hogg Ave just off Burnet Road or at HOPE Farmers Market on Sundays. Click here to learn more about this hyperlocal approach to farming and Jewart’s future plans.